When thinking of Cancun in Quintana Roo, Mexico, this is the image that comes to mind, right? 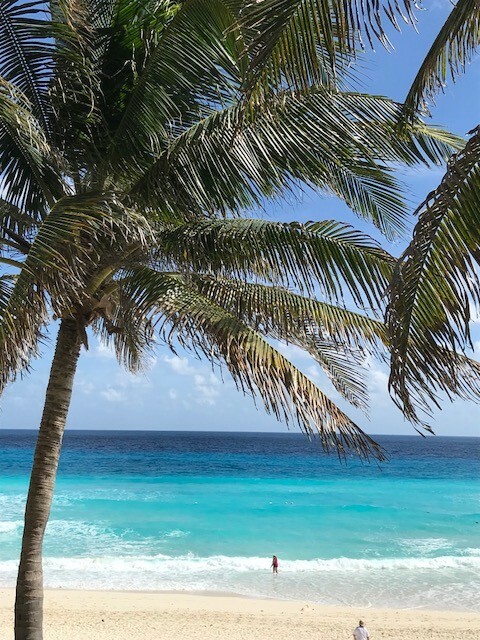 After all, Cancun is renown for its great beaches and luxurious resorts. In January, I celebrated my birthday in Cancun. And although, we woke up to this spectacular view every morning, my husband and I were anxious to see the culture of the locals in other parts of town. 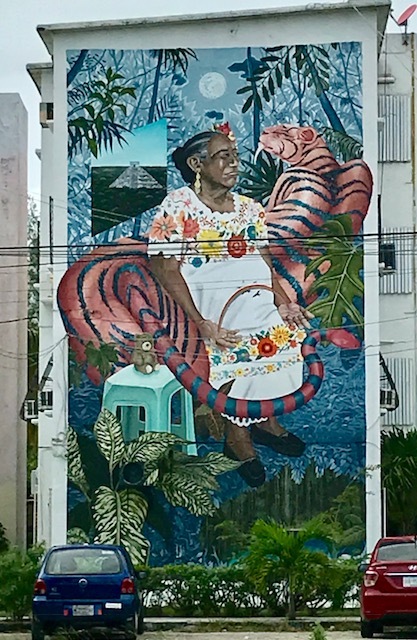 Braced with our adventurous spirits and a rental car, we drove onto Bonampak Boulevard, a commercial and residential area of the city. We immediately noticed the vibrant architectural scene. 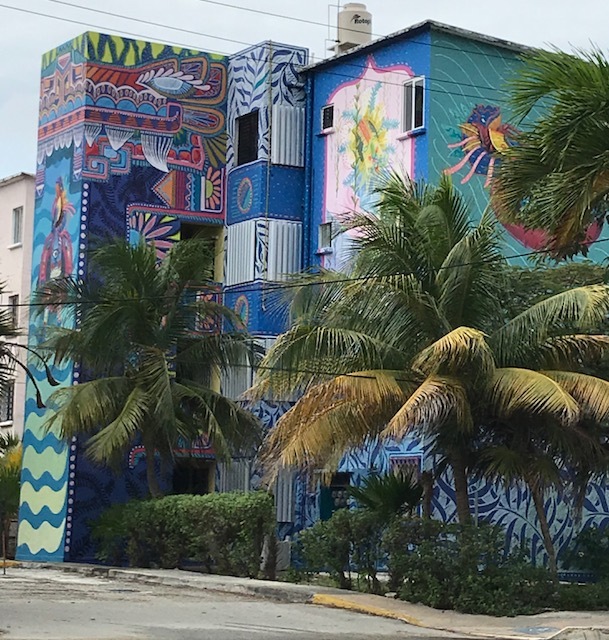 In Cancun and all of Mexico, you are surrounded by vibrant colors every day. 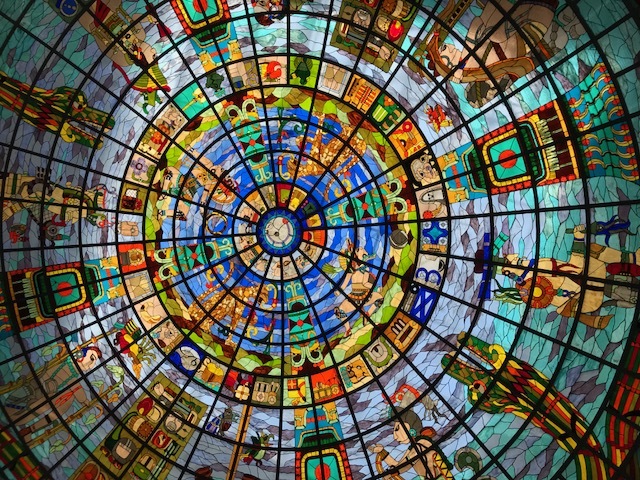 They appear in paintings, sculpture, decorative arts and in glass-domed ceilings such as this one at Kukulkan Galleria Shopping Mall. This mural is inspired by symbolism related to Middle Eastern cultures. The Hamsa Hand or Hand of Fatima is an ancient Middle Eastern symbol with an eye at center. Native American cultures also used this hand symbol. People believe this talisman protects them from the evil eye and brings them goodness, abundance, fertility, luck and good health. Here, the artist transferred the eye from both hands and placed one eye at the center of what appears to be a heart. 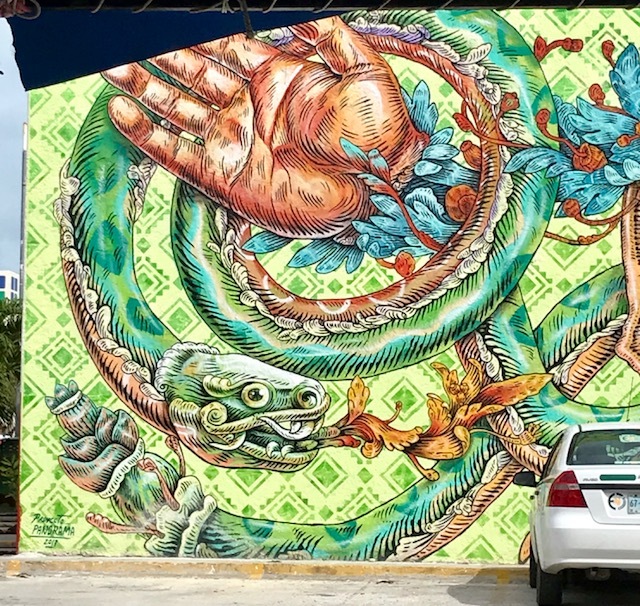 The snakes could represent the Aztec god Quetzalcoatl, also known as Kukulkan in the Maya culture. The native Maya culture thrived in Quintana Roo and Yucatan from the 9th to the 12th centuries. The mural’s brilliant snake relates to the serpent god Kukulkan (see its heads at base of pyramid (below). 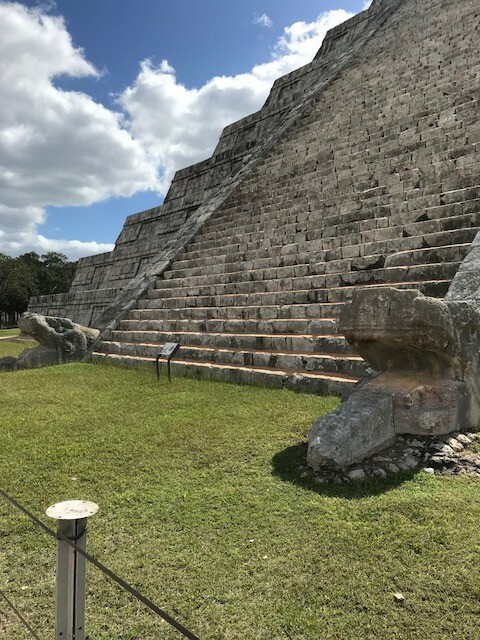 It is called El Castillo and is located at Chichen Itza, a large city built by the Maya people. This city thrived from 600 AD. until 1221. You can visit Chichen Itza by driving 2 hours via an impressive toll road. However, the most gourmet meal we had in Cancun was at Du Mexique Restaurant on Bonampak Boulevard. It is owned by Mexican entrepreneur Sonya Grimond and French Chef Benjamin Ferra y Castel. As soon as you meet Sonya and Benjamin, you feel as though you are at home. Their warmth and meticulous attention to detail are astounding. 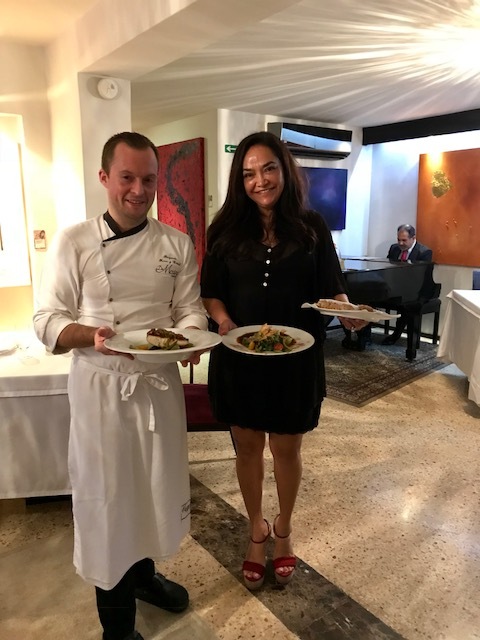 Both Sonya and Chef Benjamin serve you personally. 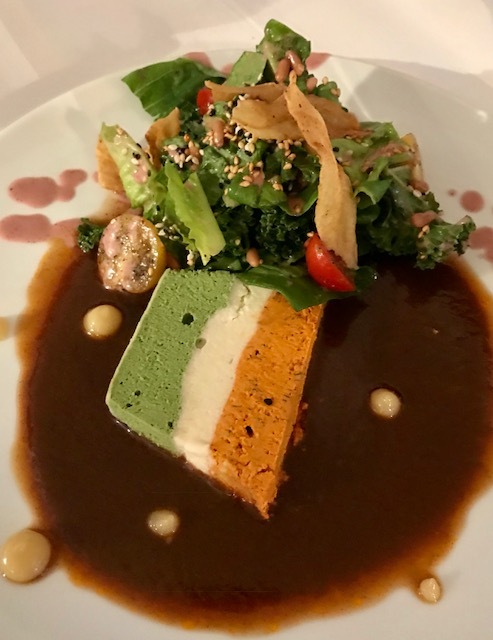 For his foie gras, Chef Benjamin innovatively lays the flavors of both France and Mexico side-by-side on his canvas – the plate. 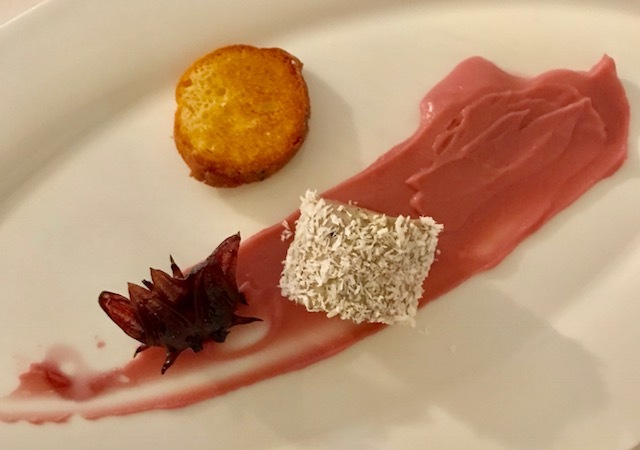 The foie gras (made from fattened duck liver) is complemented by hibiscus sauce and coconut – Mexican ingredients. 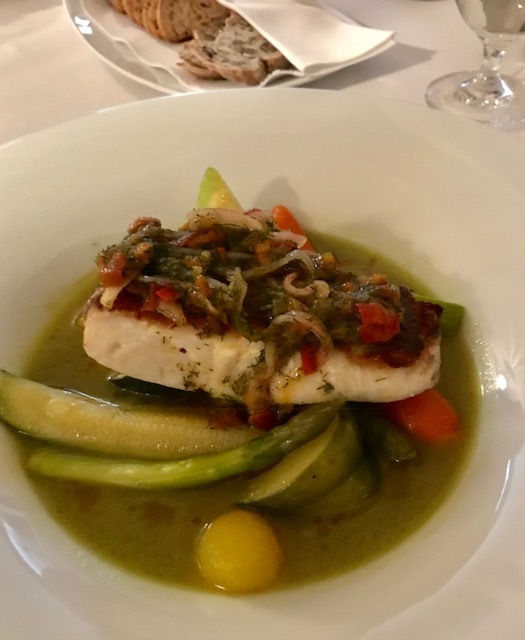 Did you know that in 2010, UNESCO (The United Nations Educational, Scientific and Cultural Organization) added the traditional and gastronomic French and Mexican cuisines to the Representative List of the Intangible Cultural Heritage? This Ocean Terrine with Mexican Flavors combines fresh seafood with vegetables from local, private farms. The Red Mullet couldn’t have been any fresher. Its flesh was still glistening – it truly went from the dock to the table! The Ixnipec sauce tasted of Habanero chile and lime/citrus juices! Since I eat gluten-free foods, this dish was perfect for me. Notice the French bread. Yes, Chef Benjamin makes bread, too. Surprised? Clearly, this was one of the best meals that I have had in a high-end restaurant! 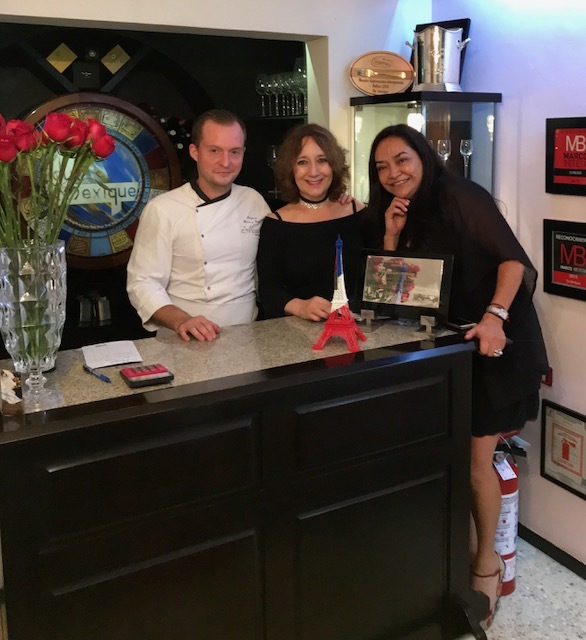 Sonya and Chef Benjamin, merci/gracias for a delectable dining experience and your personal attention. 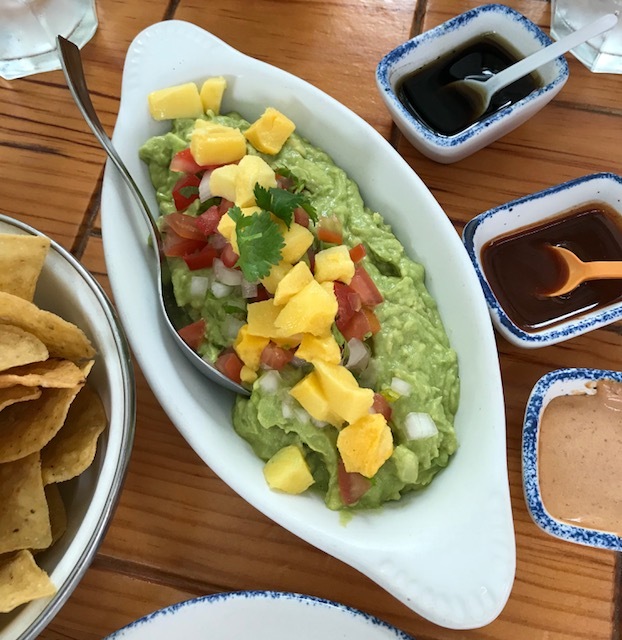 We can’t wait to come back to your fabulous restaurant and the exciting city of Cancun!